It matters a lot how good is the food you eat, and how efficient is your digestion. But it still isn't enough to guarantee health. It is the smallest piece of the puzzle - your cellular metabolism - that ultimately determines how good you feel, and how long you live. As your cells assimilate small molecules of proteins, fats and carbohydrates broken down by digestion - i.e. amino acids, fatty acids and monosaccharides - the question of whether they will be able to use them efficiently for their - and yours - wellbeing is still unanswered. And the answer depends on the final outcome of the incredibly complex chemical interaction of billions of molecules inside each of your cells. The importance of this process is summed up in its two-word description: cellular respiration. It is literally what is keeping your cells, and your body, alive. The entire process of cellular respiration can be summarized in a single sentence. Assimilated monomers (amino and fatty acids, monosaccharides) are used either for synthesis of needed molecules (anabolism), or further degraded to free the energy needed for the synthesis (catabolism). Diagram below is the very basic illustration of cellular metabolism; that is, how cells use digested food molecules assimilated from the bloodstream in catabolic (energy-producing break-up of complex molecules) and anabolic (energy-requiring molecular synthesis) phase of their metabolism. The major metabolic pathways are summarized in the table preceding it. There are many other metabolic pathways, both catabolic and anabolic. Very few, if any, comprise only a single type of reactions (i.e. either breaking down, or synthesis). It is the overall effect that determines the nature of the pathway. For the cell, both catabolism and anabolism are pretty much a part of one same purpose - staying alive. 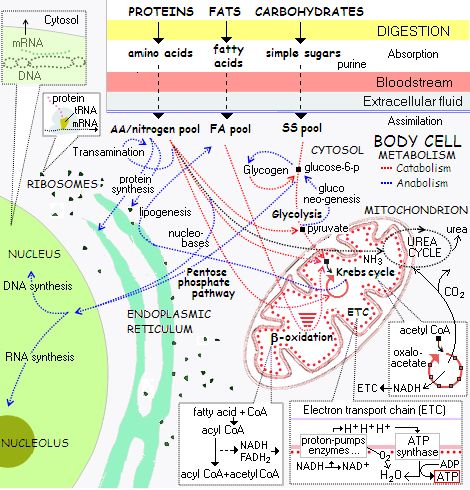 Cellular metabolism: Amino acids from digested proteins are added to the cell's pool. Some are used directly for protein synthesis in ribosomes (tiny cell's organelles scattered mainly throughout cytosol (fluid between cell's nucleus and the outer membrane), but also bound to the membranes of endoplasmic reticulum). Some are transformed into amino acids needed by the cell by transamination, and the rest is degraded by transferring their amino groups to glutamine (formed mainly in the muscle tissue and transported to liver for deamination and removal of toxic ammonia through urea cycle), while their carbon skeletons are turned into pyruvate, acetyl CoA, or into one of Krebs cycle intermediaries. Amino acid components are also used for the synthesis of purine and pyrimidine bases, which are built from amino groups and ammonia (from glutamine). The bases combine with 5-carbon monosaccharides (pentoses), specifically ribose and deoxyribose, produced in the Pentose phosphate cycle, to form nucleotides - the essential building blocks of RNA and DNA. Fatty acids from digested fats are also added to the cells' pool, and either used directly for lipid synthesis, or combined with CoA (coenzyme A) to form acyl CoA, which in a 4-stage enzymatic reaction (β-oxidation) loses two carbon groups from its carbon-group chain to form acetyl CoA; the cycle repeats until all carbon groups from the fatty acid chain are transformed into acetyl CoA. Acetyl CoA can either enter Krebs cycle for energy production, or be transported via citrate shuttle out to cytosol and used for fatty acid synthesis. Oxidation and synthesis of fatty acids are coordinately regulated by hormones and by enzymatic activity, both guided by the levels of specific metabolites. Simple sugars (monosaccharides) from digested carbohydrates are converted to glucose 6-phosphate immediately after entering cytosol; from there, the two most significant routes are: (1) transformation to pyruvate (glycolysis), which is converted to acetyl CoA to enter Krebs cycle, and (2) transformation to 5-carbon sugar molecules (pentoses) for DNA/RNA synthesis. Both glycolysis and Krebs cycle produce some energy in the form of adenosine triphosphate (ATP) and, more importantly, feed the main main source of cellular energy, electron transport chain, with high-energy electron donors (NADH, FADH2). The above diagram shows only the major pathways of the three generalized food metabolites absorbed at the cellular level: amino acids, fatty acids and simple sugars. In reality, the cell processes over 20 different amino acids, nearly as many fatty acids and three simple sugars: glucose, fructose and galactose. The above scheme is immensely simplified and incomplete representation of the entirety of cellular metabolism, but it is useful for grasping the big picture. Behind this big picture, there are many smaller, auxiliary and minor metabolic pathways, catalyzed by thousands of enzymes. Many of these pathways partly overlap, or have one or more alternative pathways, which are activated if the preferred one is inefficient or not functioning. This, in turn, changes the overall metabolic outcome, possibly significantly. Many pathways do interfere with other pathways to some extent. Also, many reactions are reversible, so the cell can switch metabolic paths back and forth, according to its needs. has to be sufficient energy available wherever it is needed. In general, degradation (catabolism) of disposable complex molecules into simpler molecules provides the energy for synthesis (anabolism) of more complex molecules needed by the cell. Any disturbance in the efficacy of major catabolic pathways - glycolysis, β-oxidation and amino acid degradation fueling glycolysis or Krebs cycle, or electron transport chain - will negatively affect cell's viability. by environmental toxins, oxidative damage and nutritional deficiencies. The enzymes are the lifeline of cellular respiration; if they are damaged or incapacitated, cellular processes that they carry dwindle. It can be anything from splitting the molecules for energy, to the synthesis of cellular structures. As a result of inefficient enzymatic action, cells become less viable, sluggish, and more vulnerable to further damage; at worst, they die prematurely, or disassociate from the body, possibly turning into some form of malignant growth. If significant in the extent and duration, such obstructions of cellular metabolism will manifest as various symptoms of compromised health and/or degenerative diseases. In other words, all the good, and the bad happening to your health comes from this tiny microcosm - the body cell. This warrants a bit closer look into cellular metabolic pathways for each of the three major macronutrients. Let's start with the sweet stuff: the sugar metabolism.